I used to be a list girl. I would grab a pen and make a list for anything I needed to sort out or remember. The problem with lists is they lack inspiration, and once the initial context of writing it has passed, they also lack relevance. Hence, my move towards boards. I have beautiful boards, collections of torn out magazine pictures, images printed from the web, articles, colours, ribbons, rocks, tiles….anything that suits the general feel of my inspiration board and adds to the overall mood. So, you can imagine my absolute delight in discovering pinterest! Instead of loose folders and clippings, you can ‘pin’ images collected from all over the web to your personal boards, to refer back to for inspiration and ideas. I’m slowly building my collection of boards ranging from topics like ‘bathroom ideas’ to ‘my wish list’. On the Be Photography Pinterest page I’m gathering some ideas for framing, displaying your images, illustrations of crop ratios and suggestions of fun things to bring/wear to your session. I’ll also be adding samples of our products for your easy reference. The boards will grow quickly so bookmark the page. And get pinning! 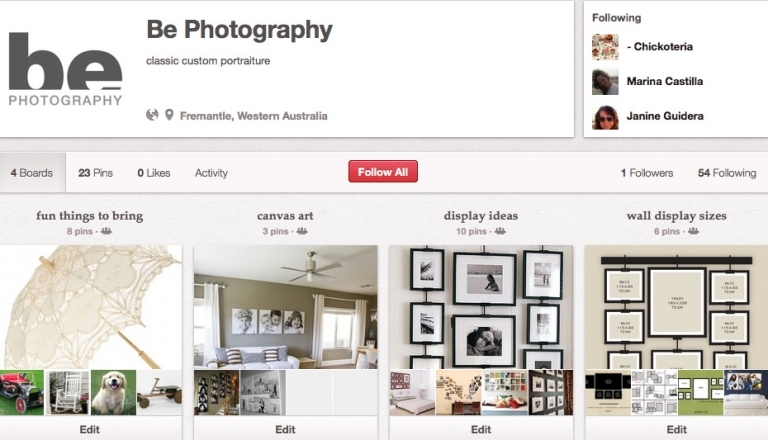 If you haven’t already, go check out pinterest and follow our boards for updates.